Carnegie Mellon University and Singapore Management University (SMU) have developed a new fast track program that may take talented students from Singapore to Pittsburgh and from undergraduate to graduate degree recipient in as little as four to 4.5 years. Carnegie Mellon President Jared Cohon recently participated in a celebration and news event marking the start of a new "fast track program" with President Howard Hunter of SMU and Chan Yeng Kit, chief executive officer of the Infocomm Development Authority (IDA) of Singapore. Carnegie Mellon President Jared Cohon (right), Singapore Management University President Howard Hunter (left) and Chan Yeng Kit, CEO of the Infocomm Development Authority of Singapore, celebrate the establishment of the new "fast track" program. The innovative "fast track" program builds on Singapore's strategy to develop a pool of talented information technology professionals through the National Infocomm Scholarship program. The Singapore government is contributing an additional $30 million to support an additional 100 scholarships to boost the strength of Singapore's skilled Infocomm manpower. Up to forty of the National Infocomm scholars are expected to participate in the new SMU — Carnegie Mellon fast track program. In a Channel NewsAsia report, President Cohon expressed enthusiasm about the quality of student coming to Carnegie Mellon to study and the benefits of the partnership. 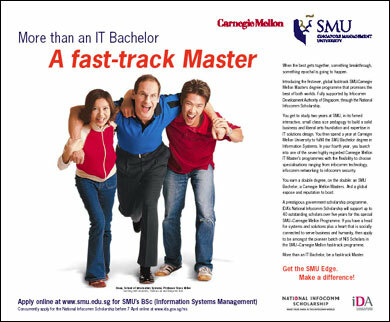 Scholarship recipients earn a bachelor's degree in information systems management from SMU and a master's degree in information technology from Carnegie Mellon. Scholars then return to work in Singapore's leading information and communications companies. Steven Miller, dean of the School of Information Systems at SMU and a former Carnegie Mellon faculty member, said the combined program would produce a "very distinctive professional with deep training in a hybrid of skills that will be extremely sought after in the new infocomm sector here." "The School of Information Systems in SMU produces a new breed of business-oriented IT professionals who have depth in both business analysis and IT solutions design. We are looking forward to this first-of-a-kind collaboration with Carnegie Mellon to groom the best and brightest for the industry under the auspices of the National Infocomm Scholarship," Miller added. Chan Yeng Kit of IDA Singapore praised the collaboration as being of "great strategic significance." "The attraction and development of top infocomm talents in Singapore are key to our ambition to be Asia's innovation hub," he said. 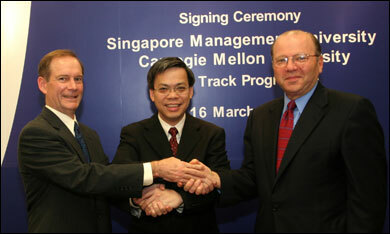 A strategic partnership and working relationship has existed between SMU's School of Information Systems (SIS) and Carnegie Mellon since January 2003. At that time, SMU entered into an agreement with Carnegie Mellon to work together to design and establish the SIS educational and research program. The student approach is highly personalized and students will be closely advised and mentored. Miller characterized the SMU part of the program as having a "highly innovative approach to business oriented IT education." SMU arranges for scholars to do internship in the infocomm industry during or after their second year. And during the first two years, scholars will receive special guidance from both SMU and Carnegie Mellon to prepare for the subsequent years in the United States. Scholars will spend the third year in Pittsburgh, continuing to take a mixture of IT, business and liberal arts courses in order to satisfy the requirements of SMU's Bachelor of Science (Information Systems Management) degree. The scholar's home base at Carnegie Mellon will be the university's Information Systems undergraduate program. Both Carnegie Mellon and SMU faculty will advise scholars on completing their SMU undergraduate degree in Pittsburgh, and on preparing for the master's program in IT at Carnegie Mellon. Scholars start on the master's program at Carnegie Mellon in the fourth year while also finishing up any remaining requirements for the SMU bachelor's degree. The program is being advertised in print publications such as the Straits Times. Scholars can opt for one of seven different IT related specializations at the master's level including software engineering, very large scale systems, e-business, information systems management, information networking, information security and policy management, and information security technology and management. The program is already being aggressively advertised in places like the Straits Times. IDA is now leading a national effort to formulate and develop "iN2015 (pronounced "in twenty-fifteen"), a 10-year master plan that identifies new possibilities for Singapore's industries, economy and society empowered by next era technologies. It aims to grow the infocomm sector and to use infocomm technology to build a well-connected society. The iN2015 master plan is a national co-creation effort by all who have a stake in the future of Singapore. This includes the views of the three Ps - People, Public and Private sectors. The strong working relationship between the two universities created the opportunity and shortened what could have been lengthy planning. SMU and Carnegie Mellon faculty are frequently regularly visiting each other, and collaborating on a variety of educational and research initiatives. For example, Teaching Professor Randy Weinberg, director of Carnegie Mellon's undergraduate IS program, has been visiting at the SMU School of Information Systems for the winter semester, and played an important role in bringing this collaboration together in such a short time period. Carnegie Mellon Software Engineering Master's program alumnus Kevin Steppe is now working at SMU's School of Information Systems as a lecturer, and worked together with Randy to coordinate arrangements with the seven master's programs on campus. "Carnegie Mellon's leadership position in global IT education is enhanced by excellent partners. Singapore Management University students will be extremely successful at Carnegie Mellon because we share an emphasis on collaboration, innovation and excellence in education," said Mark S. Kamlet, Carnegie Mellon provost and senior vice president.